Seoul is a mega-city, and joining its morning rush to attend the AICA congress provides clear echoes of scenes from Fritz Lang’s Metropolis. But once you have emerged from the hectic, albeit sparkling clean and hyper-modern underground rail network you find yourself in a city whose surface modernity is persistently perforated by tradition –in the form of ancient temples, palaces and gates- and regularly punctured by timeless mountains. The mountains, though increasingly obscured by rapidly built accommodation and office towers are never far from view and they seem to offer some immanent promise of escape and redemption if all else fails. AICA’s XLVII International Congress was hosted this year in Asia for the first time in many years and its debates were always influenced by and made aware of the region’s scale and importance as perhaps the most dynamically changing and promising context for contemporary art in the world. Seoul’s brand new Museum of Modern and Contemporary Art is just one of many symbols of Asia’s new cultural emergence. Aspects of Nicolas Bourriaud’s Altermodern thesis do seem to be holding water here as we see countries like Korea and Taiwan and of course China proceed confidently to the forefront of global contemporary art fuelled by, and embracing their own heterochronic, other and late modernities. This year’s AICA Congress was also significantly informed by the less confident and more tortuous emergence of critical responses to rapid social and geopolitical change in Eastern Europe. The Russian delegate’s presentation shocked the Congress, provoking empathetic and sympathetic responses to the plight of free, progressive, creative and critical thought subjected to a grotesque, perverse and seemingly ruthlessly reactionary regime. Art Criticism In A Divided Society, Critical Writing In An Era Of Social Networking, and Discourses In Contemporary Asian Art. 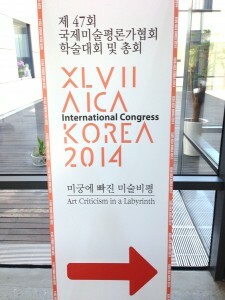 However, among the many welcomes and introductions made by the hosts, one day of short presentations by Korean art historians, critics and theorists preceded the Congress proper, aiming to open the eyes of the international visitors to Korean art’s traditional, modern, post-modern and contemporary context. The overarching title of the Congress, under the theme of which delegates had submitted their papers, was Art Criticism In A Labyrinth. This metaphor was not exploited as explicitly and repeatedly as one might have anticipated, given the panoply of art writers who addressed the audience (e.g. the name of Borges was barely mentioned) nevertheless it served as a useful reference that could equally be applied to the megalopolis, the disorientation of globalised society, to loss of freedom, direction or progress as much as to the dizzying problems currently posed by new technologies to long established professions like that of the art critic. AICA Korea’s effusively conscientious and energetic hosts took great pains to ensure that a busy working schedule ran to plan and was consistently enhanced and alleviated by sumptuous treats and trips to galleries, studios, museums, concerts, parades and dinners as the delegates were kindly ushered here and there by a young team of aspiring art critics, curators and artists professionals, each donating their services to the well-being of what will soon become their own profession. Perhaps most notable among the many cultural destinations were the formidable facility of the new Nam June Paik Art Center, and Ghosts, Spies and Grandmothers, a Mediacity Biennale curated at Seoul Museum of Art (SeMA) and at the Korean Film Archive, Seoul. Nam June Paik Art Centre, Suwon. Photo by Marjorie Allthorpe-Guyton. 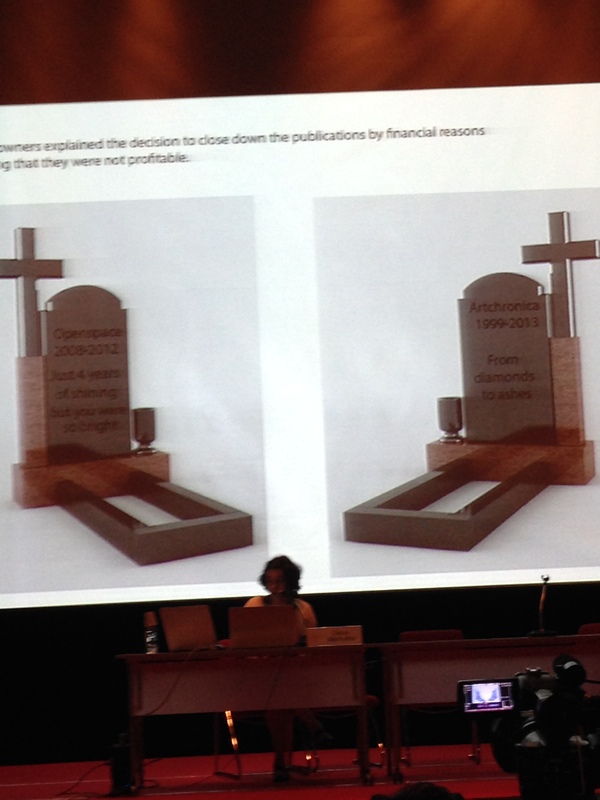 On day one of the Congress we heard Elona Lubyte’s paper on changing roles of monuments in Lithuania with echoes of Richard Serra’s Tilted Arc debate applied to a troublesome monument that moved from public ridicule to acceptance and affirmation. Jovanka Popova from Macedonia followed with a finely articulated polemic on the struggle to align critical and progressive opposition to Neoliberal capitalism beyond the intellectual and professional enclave to share the experiences and motivations of ‘working people.’ Deborah Lawler then presented the work of artists from New Zealand working in sensitive dialogue with the postcolonial condition. Her paper left us with a clear sense of the particular way in which New Zealand is approaching the shame of the past and conscientiously preparing for a fairer future. These examples provided a context against which AICA Korea’s president Yoon Jin Sup was then able to explain more of the history of the Korean peninsula where the polarity between the hyper-consumerist south and communist North is surely greater than in any other divided society. Yoon Jin Sup used his personal memories, as a child, a student and an aspiring artist and critic to describe his country’s post WW2 journey and to more clearly situate its current predicament, which he stressed was the outcome of external powers and decisions. Liam Kelly, president of AICA Northern Ireland, then responded, drawing further comparisons with the ways in which artists had illustrated the history and condition of divisions in Ireland and Northern Irish society. In the afternoon of Day 1 the papers led us further into European conflict zones. Andrzej Szczerski gave a vivid, sumptuously illustrated description of what came to be known as the ‘Maidan’ in Kiev. He focused on the diverse ways in which art and artists had spontaneously arisen to support and serve the cause of resistance and new aspirations to liberty. Marek Wasilewski, representing Poland made links between art, the assassination of the Polish president in 1922 and the controversy and conspiracy theory surrounding the death of the president and his aides in a plane crash in Russia, 2010. The Slovakian delegate Richard Gregor then gave a slightly more abstract paper that discussed ‘externality’ and the peripheral condition of emerging, post-soviet, East European states and their current relationships both to Europe and Russia. 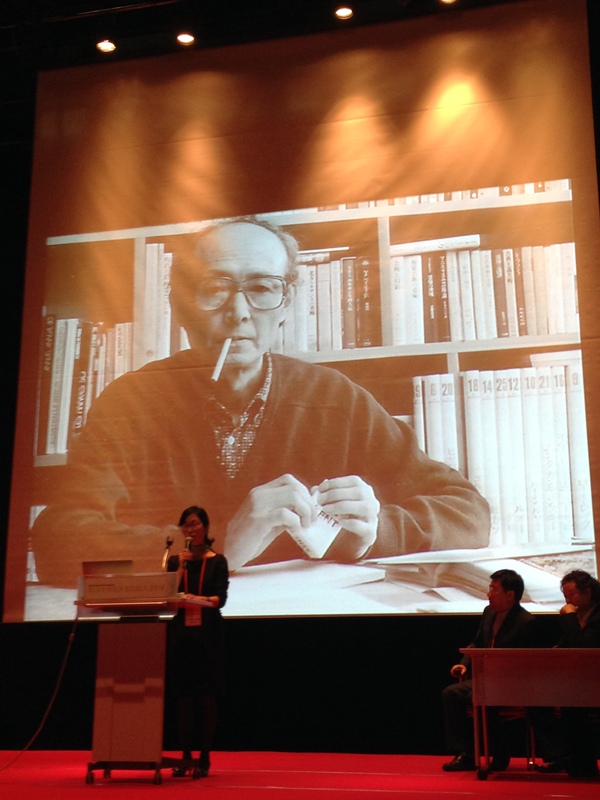 Lee Yil, posthumous recipient of the AICA Prize for Distinguished Contribution to Art Criticism. Photo by Marjorie Allthrope-Guyton. Following a Q&A session, the agenda of the day moved from descriptions of troubled and divided societies to an atmosphere of celebrations as certificates were awarded and prize-winners celebrated for their contributions to art criticism. Phil Lee (Korea), Marjorie Allthorpe- Guyton (UK), and Yoon Jin Sup (Korea) all received awards, before the mid-career critic Sun Young Lee was presented with the AICA prize for Young Critics awarded for dedication to 20 years of what sounded like quite lonely criticism, upholding standards and maintaining debate at a time when artists and curators have greatly increased their cultural position and popularity while respect for the relatively unglamorous role of critic has seemingly declined. The AICA Prize for Distinguished Contribution to Art Criticism , equivalent of a ‘lifetime achievement award’ was then given to the late Korean critic Lee Yil who, having trained in Paris became a central, reassuring and guiding figure for the generation of Korean artists negotiating the influence of Western Modernism, and against which – with the help of Lee Yil- they forged their own, idiosyncratic responses – most notably in the works of the group known as Dansaekhwa, achieving the enviable feat of staying true to local cultural traditions while both opening and responding to post WW2 Euro-American art. In moving presentations by his daughter, pupils and peers Lee Yil came across as a father figure (albeit an appropriately transgressive one) whose voice and consideration had provided a crucial point of orientation for a generation. 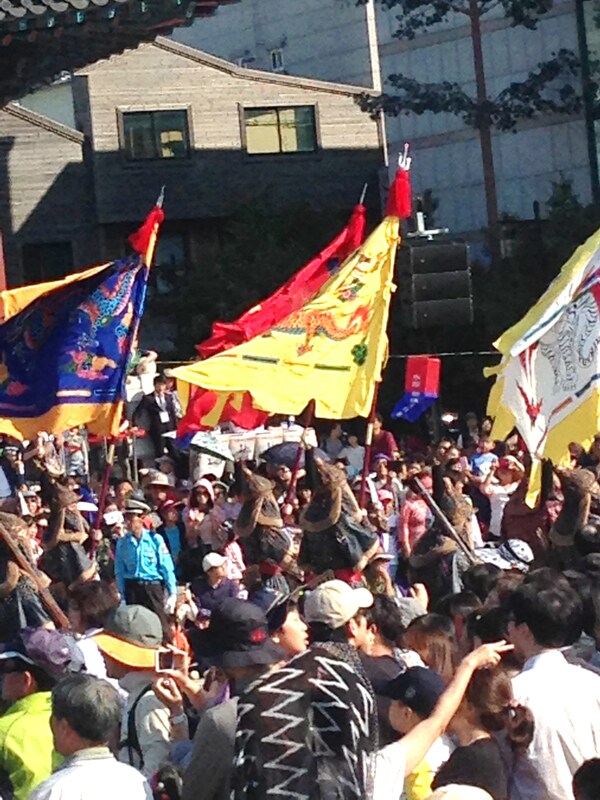 AICA published Lee Yil’s collected writings in 2013 and an English translation is to follow. Day 2 began with a keynote from Lev Manovich representing USA and the big data, post-internet approach to contemporary art, culture and theory. He brought sumptuous graphic analysis of millions, if not billions of uploaded photographs and pitched the potential for this new cultural resource to act as a critical and analytical tool of 21st Century critique. By means of unprecedented, infinitely detailed formal and quantitative analysis of the swarm of images now pervading the internet, or, for that matter, those pertaining to the career archive of any artists, Manovich suggested we might gain new understandings of art and culture or perhaps change our entire idea of what a critical analysis might be. Subsequent questions (and a response from the author of this report) nevertheless explored this spectacular presentation with due criticality and scepticism, pointing out the dominance of quantitative and formal analysis, as well as the reductive issue of basing analysis on a relatively narrow stream of the most easily accessible and most malleable (digital) data to understand or define a world of far greater empirical complexity, hapticity etc. Maria Amelia Bulhões from Brazil demonstrated her adaptation of Blog formats to an effective means of distributing and broadening interactive critical debates on contemporary art. Earl Miller from Canada then presented a slightly more sceptical response, describing the way that some critics have been forced to adapt their personae to that of a populist facebook protagonist in order to survive in the internet’s uncritical sea of effervescent, casual and unprofessional opinions. Korea’s Sung-Ho Kim then made a provocative assault on professional language and English as inappropriate restraints upon the burgeoning possibilities of online criticism which might today be justifiably reformed and redefined according to more global, technologised and colloquial voices. Paul Groot from Holland concluded the morning session with a spectacularly disembodied presentation. While the presenter turned his back and joined the audience in watching a narrative in images while a computer ‘spoke’ the writer’s artfully composed text which blurred the relationship between artwork and critique at one point invoking Duchamp’s Large Glass as comparable with the (often shattered) surface of the Samsung Galaxy, a Hi Tec device of Asian origin that has come to determine much 21st century cultural exchange. After lunch Ewa Wojtowicz extended Earl Millar’s earlier comments by providing several more examples of current critical practices online that adapt successfully – and often mischievously- to the dominant format of social networks. Most prominent among her examples was Hennessy Youngman, while Jerry Salz (previously referred to by Earl Millar), was also mentioned. Interestingly, the Q&A related to these presentations was able to historicise these cutting edge practices according to the legacy of critics like Baudelaire and Diderot and the historic role of the critic in communicating beyond their immediate urban milieu to reach more provincial art enthusiasts using their own contemporary technologies i.e. the printing press. Diana Machulina presents. Photo by Marjorie Allthorpe-Guyton. The day then seem to take a darker turn as Diana Machulina from Russia detailed perverse reactionary thinking and appalling abuses of rights in her country involving the oppression and crude censorship of free thinking and writing. She also outlined her discovery of a surprising tendency to find more spaces of progressive freedom and possibility beyond the capital and major cities in smaller towns and provincial districts. This may be because they are distanced from the kind of myopic and highly competitive social ambition that seems to have has become a trademark –both on an individual, consumerist level and on a state, national and presidential level- of post-Soviet Russia’s urgent grasping for new forms of status, power, wealth and territory. 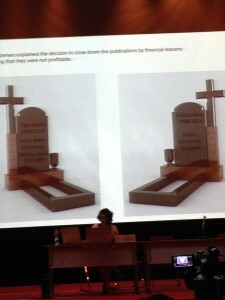 Machulina’s paper drew a kind of horrified response from the congress, accompanied by a strong sense of empathy as the audience asked how AICA and its members might be able to do more to help alleviate the bleak prospects of art writing in Russia today. Elisa Rusca of AICA Switzerland then pulled us back to the theme of directly dealing with online writing and activism by means of making more informed and ethical choices about how we should operate on the web and through the internet. The answer, she suggested, was not to diminish or turn away from technology but to grasp and understand it better, to retrain and re-empower oneself if necessary in able to turn this phenomenal resource to our advantage. Professor John Clark began Day 3 of the congress with a keynote that focused on the work of a single artist, Araya Rasdjarmrearnsook from Thailand. His presentation mapped a career that progressed from expressionistic, melancholic images through into what appeared to be a more objective, colourful, ironic and global visual language influenced by the artist’s encounters with international recognition and biennale culture while nevertheless maintaining a dialogue rooted in her emerging Asian cultural geography. Simon Morley – an English artist, writer and teacher based in Korea – then gave a second keynote paper attempting to celebrate and position the Korean Dansaekhwa painting movement as less a regional spur of Euro-American modernism and more as a way of painting that informed, extended and even contradicted modernism precisely by maintaining and extending certain national, cultural and local traditions, values and processes. After lunch Silva Kalcic from Croatia proposed a New Orientalism citing examples of emerging artists seen to actively re-appropriate orientalist imagery and redeploy it as a form of detournement aiming to reactivate and challenge a complacent occidental gaze. Jean Louis Poitevin regaled the congress with an enthusiastic collage of connections to a central and yet liminal concept of ‘split’ or ‘splitting’ which could be applied to East/West, art/critique, difference, and used as a way into or out of the ‘labyrinth’ referred to in the title of this years congress. Next Chwi-Jeong Kim from Korea surprised the mostly progressive-minded critical assembly with what seemed to be a rather conservative, nationalist and perhaps Romanticist approach to criticism. She very confidently – and too simplistically for some- defined value and beauty – in art generally and for Korean art (as ‘Koreanity”) in particular- before setting out a limited set of consistently applicable criteria according to which Korean art might henceforth be reliably evaluated. 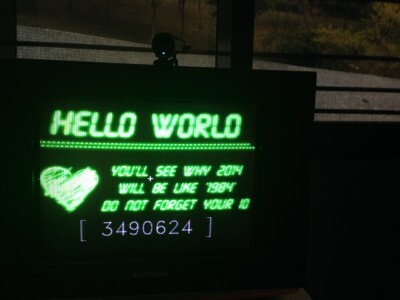 Another Korean contributor, Young-hee Suh followed this up with a descriptive synopsis of Nicolas Bourriaud’s theories of Relational Aesthetics, The Radicant and Altermodernism which unfortunately ran out of time to apply them, as intended, to the works of Korean artists Kim Sooja and Huang Yong-Ping. In the final session of the final day of the congress Ketevan Kintsurachvili gave a detailed description of the impact of Asian art on the modernist Georgian artist David Kakabadze. This was followed by Atteqa Ali’s description of evolving curatorial practices in United Dubai and what she referred to as ‘the whole MENASA region’ (Middle East, North Africa, and South Asia). Raylin Tsai from Taiwan gave the final paper, running out of time to fully communicate his effusive, enthusiastic and (literally) colourful presentation which used imaginative language and wordplay to comment on the philosophical problems (citing Lyotard and the concept of the ‘humanoid’) possibilities and problems for criticism in the 21st century as seen through intense technologisation, globalisation and from an Asian perspective. Kings’ Parade, Suwon Cultural Festival. Photo by Marjorie Allthorpe-Guyton. Following the three days of debate and discussion the AICA International General Assembly met for another day to hear reports form its various commissions and national offices as well as to hold elections and look ahead to the next congress. This was followed by Post-Congress trips to various Asian Biennales. Ultimately the experience of the Congress left the author of this report, and I suspect many of the other delegates, with a reinvigorated view of, and some renewed pride in the purpose, importance and persona of the critic and criticism in the 21st century. Technologisation, globalisation and oppression may today present significant challenges to the profession of art criticism but scrutiny and celebration of its (perhaps insufficiently publicised) history will surely provide numerous examples of committed and creative responses to similarly changing contexts and responsibilities.